The College of St. Scholastica is proud to announce the recipients of a major scholarship that provides a full year's paid tuition to three non-traditional students. The purpose of the "We Believe in Saints" scholarship is to help create confident, well-qualified leaders in the business and technology sectors. To be eligible, applicants must be non-traditional students entering a School of Business and Technology accelerated on-campus undergraduate or graduate program at one of St. Scholastica's Minnesota campus locations. Scholarship winners are Kevin Kangas of Cloquet, who will enroll in the MBA/MAM dual degree program at Duluth's extended campus; Julie Vang of Woodbury, who plans to pursue her bachelor's degree in organizational behavior at the St. Paul campus; and Julie Platta, who will work toward her bachelor's degree in organizational behavior at the Brainerd campus. 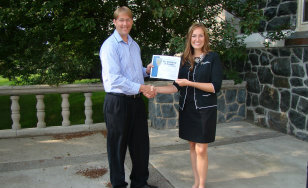 Kangas, who is an engineer at Essar Steel in Hibbing, said he was "thrilled and honored" to receive the scholarship. "It means everything," he said. "It's giving me an opportunity that I'm extremely grateful for." Kangas said that lifelong learning is a priority for him as he seeks to provide a positive example for his children. His daughter will start college in the fall, and his son is entering his junior year of high school. Vang, who works as a medical appointment scheduler at HealthEast Care Systems, said that she has always wanted to go back to school to earn a college degree, but "life happened" and she never found the time or money. 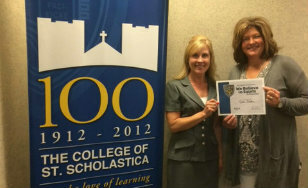 She decided to apply at St. Scholastica after a friend who works there told her all about the college. She is grateful to have found an opportunity that will broaden her future career prospects. 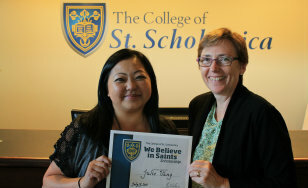 Platta works as a registration transfer specialist at Central Lakes College, and is excited about how the We Believe In Saints Scholarship, and her education at St. Scholastica, will impact her future at CLC. "I want to finish my degree so I can continue to work with students but have a greater impact here at CLC," she said. "My two sons are now off to college and it's time to finish my degree; it will round off the experience I already have. I am very grateful for this opportunity." All three said that St. Scholastica's flexible class schedules will allow their continuing education to fit into their busy work/life schedules.